With ActiveCampaign, you are turning your e-mail marketing on high gear. With the reach e-mail marketing automation features of ActiveCampaign, you can reach out to your customers easilly, and nurture them into repeated buyers. 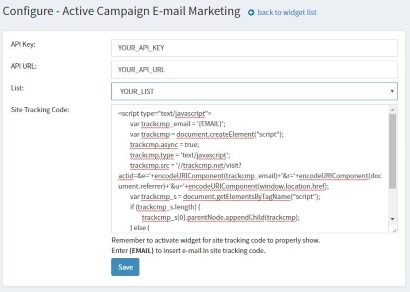 The plugin also integrates with the Site Tracking feature of ActiveCampaign for even more possibilities in e-mail automation. With Site Tracking, you can trigger e-mails whenever a user has reached a certain page - that's how powerful it is! Currently supports nopCommerce version 4.10, 4.00, 3.90, 3.80, 3.70. Contact us if you want to get it for another version.